When I went into Henry's room this morning and turned on his light I said, "Morning baby! Are you ready for your first day of school??" To which Henry replied, "Five more minutes Mama, just five more minutes..." As he pulled his quilt up over his shoulder and flipped over. As I walked out of the room to give him a minute I hear him say, "mama... light off please." I could not get a normal smiling picture of the boy all day. He is a little anti-camera right now, putting his hand up and saying "no pictures, no pictures!" as if he is hounded by the paparazzi. 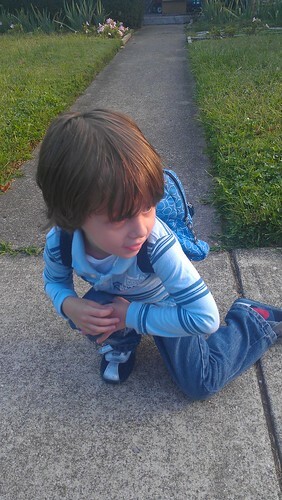 He did think this pose was pretty cool though. Backpack on and heading in. He said something about wanting Mama to stay with him on the ride over, but once we actually got there he was completely good to go. Papa came with us for the first big drop off, not that it was eventful. We were prepared for tears and hugging, begging to stay...He actually ran right into the room while we talked with his teacher and the director. 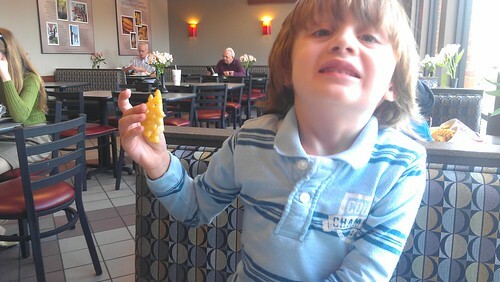 I went to wave bye, but he was sitting eating with another little boy playing with a Thomas train. He seemed completely content in this new place so we just headed out. This is him 'smiling' for the camera. His 4th birthday picture slide show will be interesting. 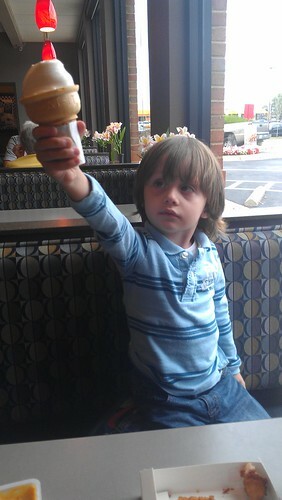 As a reward for being such a big boy we had Chic-fil-a ice cream cones (FREE if you trade in your kids meal toy. Genius). The two of us sat at the table and talked about his day. He told me what he did, and I sat and smiled and thought, 'How are you this big already?" 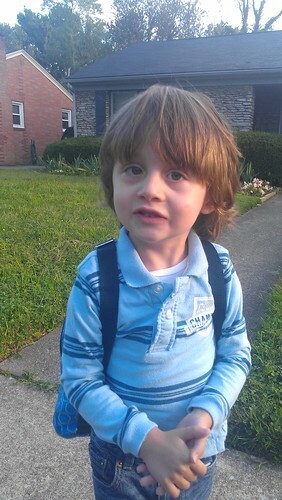 It was a really really great first day of preschool. Aw! Such a big boy! You didn't say if you cried or not! 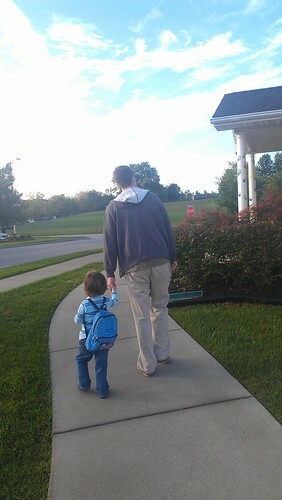 Love his little backpack. 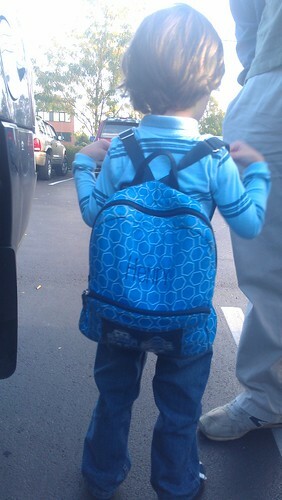 He's such a big guy going to preschool!